True to its name, the big skate is the largest skate in North America. Its general shape is similar to that of a sting ray: its flattened body and pointed snout merge with wide pectoral fins to form a diamond shape. It has a long tail, with large pelvic fins on either side of the tail base. Dorsal fins are placed near the end of the tail, and all other fins are absent. The big skate is a grey-brown colour that blends in well with the sandy-bottomed areas it inhabits. It also has large yellow and black or dark brown eyespots on its pectoral fins. Biologists believe the eyespots are for protection against predators when camouflage doesn't do the trick - either to confuse predators such as sharks, or to make the skate look more intimidating and less of an easy target. Click here to read more about this species and to see more photos. A big skate found in the waters off of West Beach, Calvert Island; approximate depth was 7 m. Photo by Alex Laliberte. The big skate's range extends from the eastern Bering Sea, eastward through the Aleutian Islands, and southward along the west coast of North America to southern California. It is common in shallow waters, though can be found at depths up to 800 m. It inhabits sandy and muddy areas, where it can camouflage with the ocean bottom as in the above photo. The big skate is one of two common skates found off the west coast of North America. The other is the longnose skate (Raja rhina), which is nearly as large as the big skate, but as per its name it has a longer, more tapered snout. 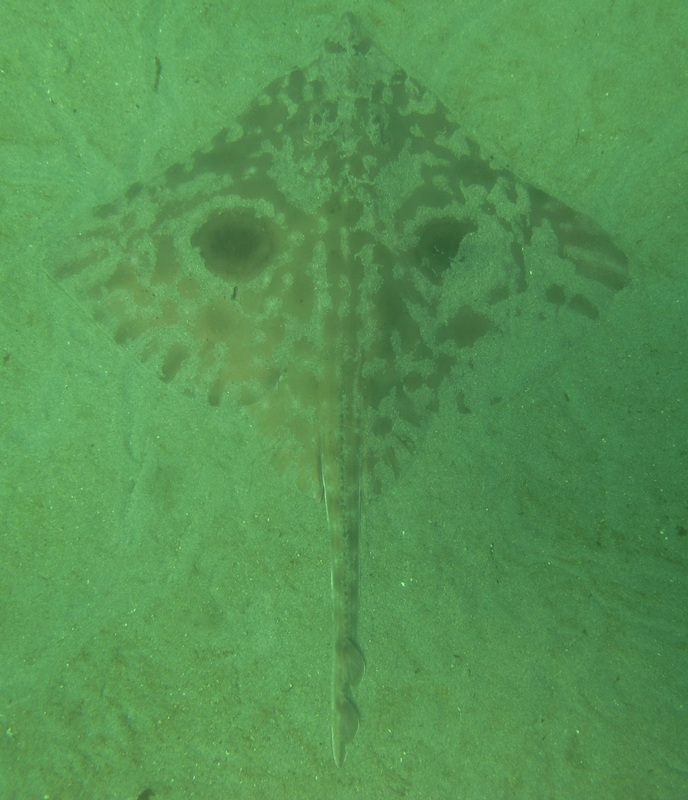 Unlike the big skate, it has mid-dorsal spines, one or two of which are found right behind the eyes. It also has smaller eyespots on its pectoral fins and larger, incised pelvic fins between the pectoral fins and tail. These differences are clearly visible in the following depiction of the two species. Their ranges are similar, except the range of longnose skates extends further south than big skates, into Baja California and the Gulf of California. Additionally, the longnose skate tends to inhabit deeper waters, in areas of mixed mud and cobble bottoms and around rock ledges. This species is caught for consumption and for display in aquariums. As with other skate species its pectoral fins are edible. Skates are greatly appreciated in Europe: they are a regular presence in European fish markets and classy European restaurants can charge high prices for skate dishes. In North America it is a common bycatch species and generally is discarded as "garbage fish," though in recent years this has started to change as other fisheries decline. Like many other skate species, the big skate is a subject of increasing conservation concern. There are two conservation aspects of concern associated with big skate harvests: the effects on the big skate populations, and the effects on its habitat. Generally it is not a major fishery target, although there are commercial and recreational big skate fisheries in California. In BC it is most often caught as bycatch with other target species and until recent years were discarded. Due to market changes, landed big skates have been increasingly retained in the past decade. Together with longnose skate it makes up more than 99% of skate landings in BC. It status as a common bycatch species is enough to have significant effects on big skate populations. The species' slow reproductive rate and relatively long lifespan means it can be easily overfished, even when unintentionally caught. There is currently little information on population numbers and minimal management of big skate landings in BC. The big skate is fished by longline and bottom trawl. The latter method can cause significant habitat destruction, and both methods have high levels of bycatch (over 20%). Furthermore this fishing method, along with other destructive methods such as dredging, can capture significant amounts of skate egg sacs known as mermaid's purses. Click here to read more about issues facing big skate fisheries, and why SeaChoice recommends avoiding big skate seafood products. This species is listed as near threatened on the IUCN (International Union for Conservation of Nature) Red List of Threatened Species, but no conservation measures are currently in place to prevent its status from declining. Click here to read more about this designation. They are not listed as at-risk by Canada's Species At Risk Act (SARA), though big skate population structure is relatively unknown. The largest big skate ever recorded was 2.4m (8') long! Big Skate. Monterey Bay Aquarium. Monterey Bay Aquarium Foundation. Accessed 25/06/2013. Big skate (Raja binoculata). ARKive.org. Accessed 26/06/2013. Froese, R. and Luna, S.M. Raja binoculata Girard, 1855. FishBase.org. Accessed 25/06/2013. Raja binoculata Girard, 1855. In Klinkenberg, Brian. (Editor) 2012. E-Fauna BC: Electronic Atlas of the Fauna of British Columbia. Lab for Advanced Spatial Analysis, Department of Geography, University of British Columbia, Vancouver. Accessed 25/06/2013. Wallace, S. (2006). Seafood Assessment: Longnose Skate and Big Skate Raja rhina and Raja binoculata. SeaChoice. Blue Planet Research and Education. Accessed 25/06/2013.